Karnazes, right, ran the 2009 Chicago Marathon twice! 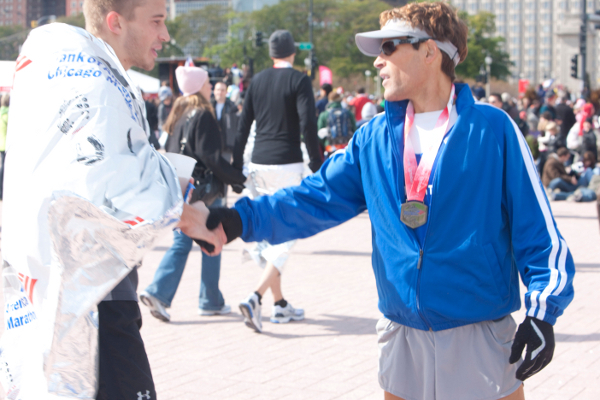 In the running community, Dean Karnazes, the self-titled ultra-marathon man who’s run countless miles and long-distance races, is a popular guy. So popular among Chicagoans that when they hear he’s coming to the Windy City, they flock to meet him. Karnazes currently is touring the country and spreading the word about The North Face Endurance Challenge Series, which hosts trail races of varying distances including one in Wisconsin in September. Last night, Running Away Multisport hosted Karnazes at their Chicago store at 2219 N. Clybourn. It was a packed house with Karnazes running three to five miles with the group and then answering questions about running, ultramarathons and more. Karnazes was such a huge hit with the Chicago crowd that RAM is repeating the event. Tonight, they’ll be welcoming Karnazes to their Deerfield location, 800 Waukegan Road. The fun starts at 6 p.m. with a three to five mile run that’ll end in a Q&A session back at the store. The North Face will be on-hand with giveaways and raffles throughout the night—you could win a race entry as some lucky attendees did last night. I know, I know. This event is competing with plenty of other running events happening tonight like the Run for Gus and the Undie Dash, but it's not every day that Karnazes runs through town. And it's too nice outside not to lace up those running shoes. He recently completed his 10th Badwater Ultramarathon. This foot race travels 135 miles through Death Valley where temperatures reached roughly 131 degrees. He's run on all seven continents--more than once. In 2006, he ran 50 marathons in all 50 United States over 50 days. He runs so many ultramarathons that a marathon, at 26.2 miles, is considered short. Registration for tonight’s event is requested by the Deerfield store. You can contact them by calling 847-945-2929 or tweet RAM, @ramultisport. And stay tuned for more about Karnazes. I can't get up to Deerfield tonight to meet him but I did get to chat with him this afternoon. And he may have even twisted my arm to run farther than 26.2, the distance where my legs kinda just stop (unless there's a swim and bike involved). Photos from MWW Group for Volkswagen of America who provided photos in 2009 when Karnazes ran the Bank of America Chicago Marathon. Not the trail or TNF, but it's Dean.